Alas my wife is gone. 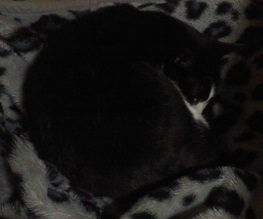 She left me alone. I have no idea where she is nor what I should do, but I can say at least I have no time to play SAS4 for the time being. Aaaaahhggghh!!! Mates, sorry for my absence for a while. Surely I will back soon. There are few obstacles nor walls in this map. It is a fun to play outdoor combat simply with no camp, no tactics, but it’s a challenging way to aim a high score. The center area surrounded by cars (X,Y) can be both a good and bad place to camp. It is too bad we have to shoot all over 360 degrees directions when we don’t have a good control of the zombs approaching paths. When we camp at X/Y, it’s easier to survive when we control them to come from as upper paths as possible. That is, blue path rather than red one in the picture. 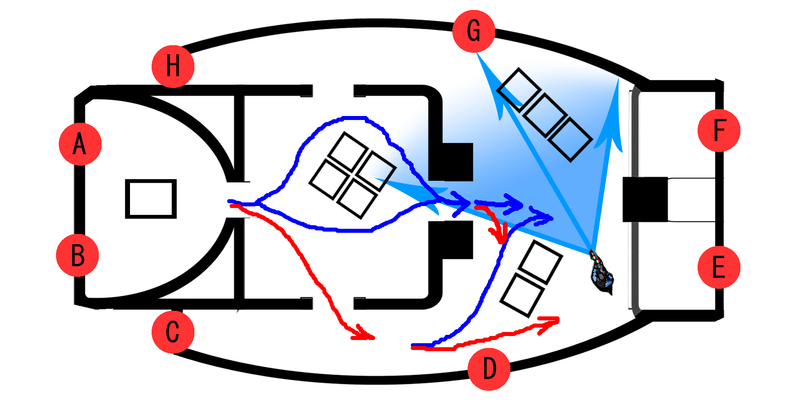 For each spawn site, the conditions in which they prefer the blue path are like below. (B)- Both players are in (X) or (Y). In short, always enter from (E3) and keep standing X/Y (one in X, the other in Y). Then most of the conditions above would be met. 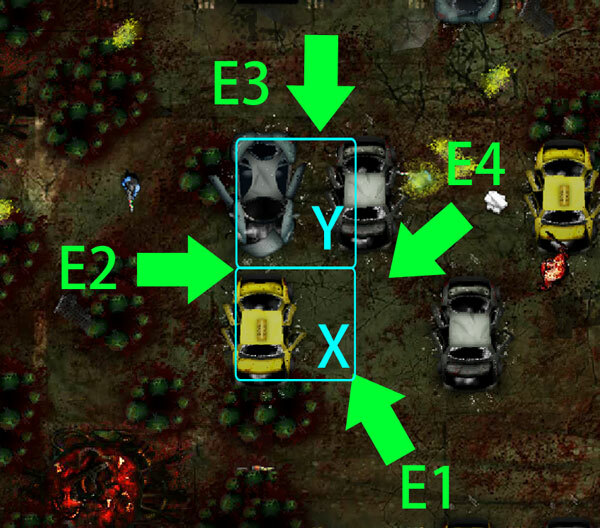 More better to leave footprints (E2) then reenter from (E1) to lead (A) spawns into better path(not sure). In this way we can concentrate them mainly at our upperside, and force them to walk longer so that we can get enough time to kill. Large bosses cannot pass through narrow paths except DMs. We can lead them to S1-S3 in the pic below and they’ll be stuck there. We can shoot other zombs safely while they are stuck, but be careful because they sometimes slip out especially when they are in fast movement. One of the hardest map in apocalypse. When each wave starts one of my favorite place to stand is the rightside bottom in the map. Then I shoot mainly in the range between the skyblue arrows in the picture. 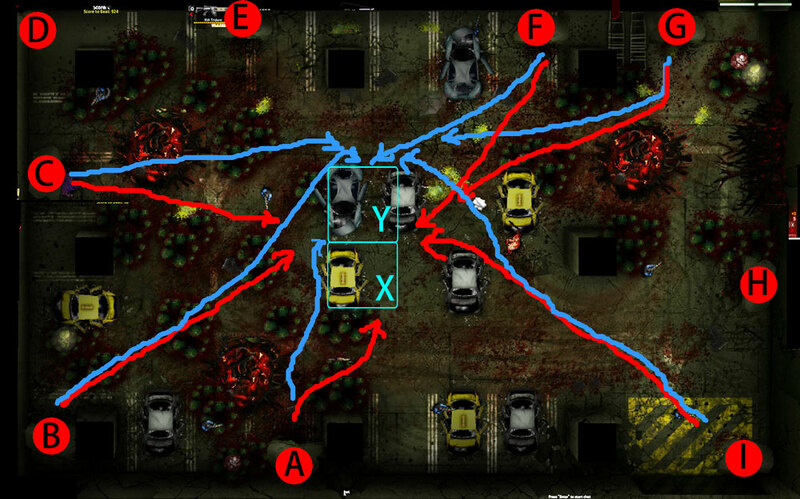 To survive all waves successfully I have to control zombies including bosses which spawn from (A) + (B) – the most thriving spawns site – to come in the blue path, not red ones. Because while they come out the middle room mainly from the center gate, I can concentrate on my main battlefield between the skyblue arrows. It’s inevitable that other zombies which spawn from rightside (E) and leftside (C) hinder my shooting in the main battlefild. But there are not so many of them that I can handle it. However if I allow them from (A) + (B) to come in the red path, they will join the leftside hindrances and they are no longer possible to handle. To lure zombs from (A) + (B) into the blue path, I walk on those paths and leave our footprints in advance. When any of us walked on the red path even once during the wave, we have to redo it without fail before the next wave starts. As you know they always watch and chase players’ current location but that’s not all of their action. They also track our footprints when they choose their way to get to us. On all apoc maps I’m trying to make a good use of the zombs nature to chase footprints. Apoc is basically a game for 2 players. When I stand on X, another player will stand Y in the picture above. 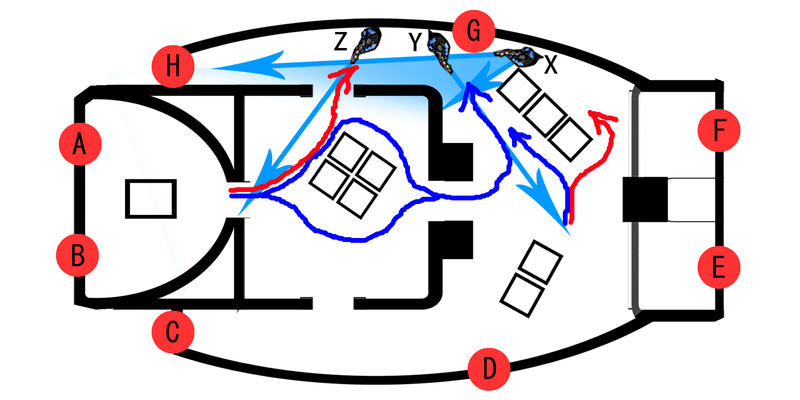 To put this tactics into practice, both players have to understand our tactics well and the zombs’ nature to chase footprints. Actually it is difficult to achieve when I play with random players. There are similar tactics because this map has almost symmetry in upper and lower half. 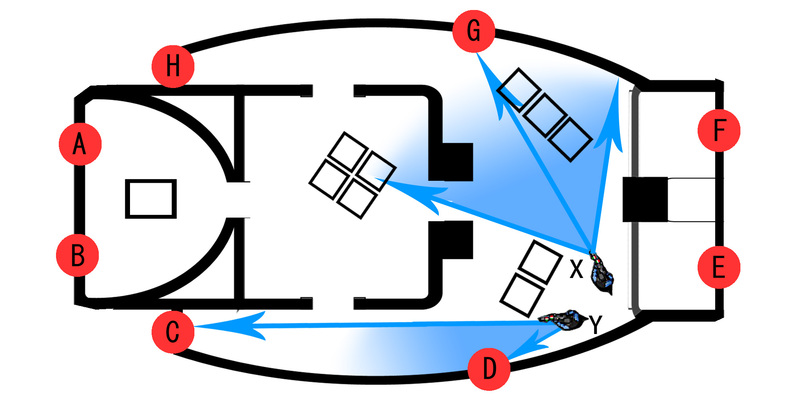 It is needed to arrange the tactics because three tables are placed unsymmetrically in the map. Basically both players stand at X and shoot mainly to leftside. Controling the zombs path is easy. Just walk from the leftside and stand at X. All zombs come from our leftside except a few spawns from (F) and and DM ones. 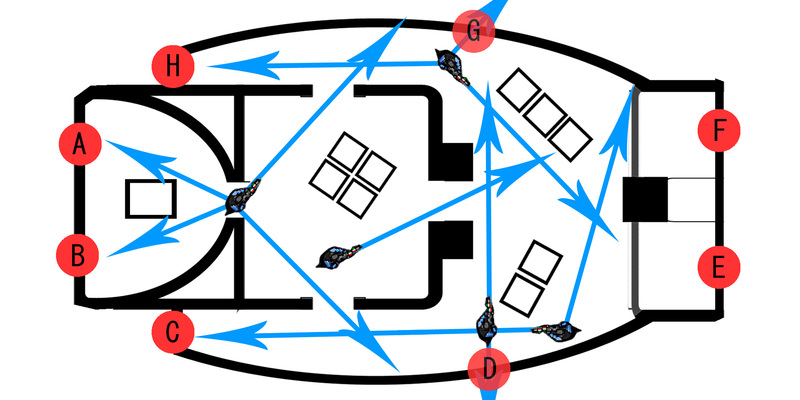 We also can control the path from (A)/(B) in the same way as the first tactic. When the necros are the extra fast ones, blue path is longer and better to kill safely. 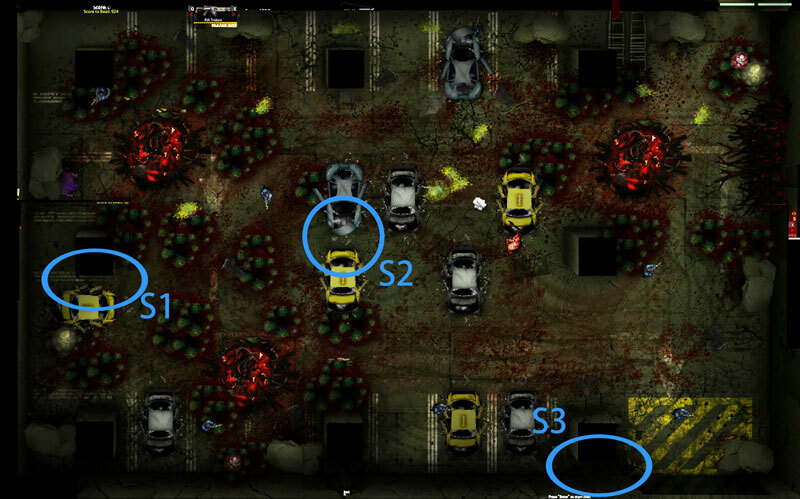 The problem is that I can’t kill zombs in the center area directly from X, and I have to move to Y to shoot them. Additionally it needs my partner to cover me from X, or I will die soon. It is okay that both players stand at X and shoot leftside all the time when we both have good computer and our total fire power is enough to kill all in that short range (colored skyblue in the pic). If not, I often have to move Y or Z to prevent too many zombs from walking in their long path. Otherwise, our computer will be crushed or simply overwhelmed by those pooled zombs. It is a great merit of this tactic that there’s no need for us to know the zombs’ footprint chasing nature. I would adopt this tactic when I play with random players. I just need to tell my partner to come to X from the leftside and stay behind the 3 blocks. Of course we still need to cooperate nicely to utilize our fire power maximumly. I fixed some pages on this website and explained my opinion to NK.